For people searching for a drink that is both delectable and full of possible health benefits, one has to look no further than hibiscus tea. The tea has vitamin c and minerals and possibly has the added bonus of supporting cardiovascular health. Below are only a few reasons it might be advantageous to include this beverage in your diet. One reason for the consumption of hibiscus tea is to help lower blood pressure. There have been studies conducted that show the tea could help lower blood pressure and manage cholesterol. In one study, test subjects who drank three cups of the tea daily had lower blood pressure at the end of the six-week test period. Research demonstrated that the tea lowered the systolic blood pressure (the top number in a blood pressure reading) by the end of the clinical trial. The clear positive effect of lower blood pressure in people with mild hypertension is a decreased risk for heart attack and stroke. The studies are hopeful for people who are searching for natural methods to control high blood pressure. Experts are quick to point out that more research is definitely required to wholly validate the claims of these positive effects of drinking hibiscus tea on blood pressure. Another reason to drink hibiscus tea is to facilitate weight loss. The tea includes an enzyme inhibitor which blocks the production of amylase (an enzyme that breaks down complex sugars and starches). Drinking a cup full of hibiscus tea right after a meal can decrease the absorption of fats and carbohydrates which can help people lose weight. The amylase inhibitors are found in their natural state in the tea, which makes them safer and better than those found in weight loss drugs. This is obviously great news for people desiring a natural alternative to artificial methods of enhancing weight loss. In addition to the weight loss benefits, it can also help cleanse and rid the body of excess fluids. One last reason for drinking hibiscus tea is for its wonderful flavor. The tea has a nice tart, tangy flavor that is almost berry-like in nature. The flavor can then be enhanced by the addition of mint, cinnamon, or ginger. The taste can be quite tart for some people and may necessitate the inclusion of a sweetener such as honey or sugar, especially in stronger brews. The tea may be consumed hot or cold and is caffeine free making it a wonderful tea not only for a hot summer day but also a cold winter night. In closing, it is apparent that hibiscus tea is a great drink that potentially has many health benefits. Studies have shown it has positive effects on blood pressure and cholesterol and also assists in weight loss. Hibiscus tea is a natural alternative for supporting good cardiovascular health while at the same time providing a refreshingly unique flavor. 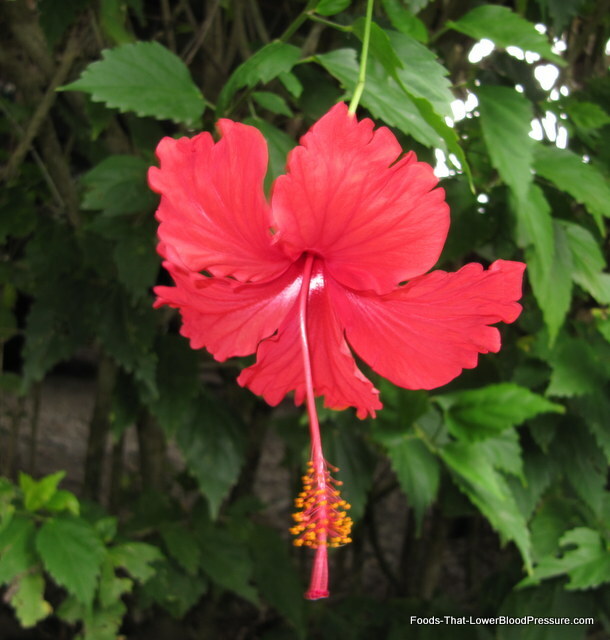 If you are interested in more information on hibiscus tea, please check out http://www.hibiscusteas.com.